I’m Giving Away a Book! Later this month I am participating in Glennon Melton’s Messy, Beautiful Warriors project on Momastery. This means I will be writing a post that is linked to Momastery and maybe, if I’m lucky, it will be reposted there. I am a big fan of Glennon so I am excited about this opportunity. What’s in it for you? A free book! 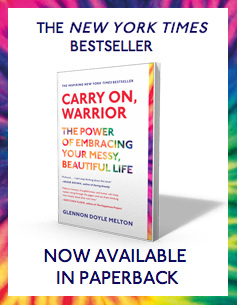 Because I said I would write about being a messy, beautiful warrior, Glennon sent me a copy of her book to give away. I own it and I’ve read it and it’s great. Randy even read it, and he mostly reads tech blogs and news and books about programming, so that’s a testimonial right there. Any reader who makes a thoughtful comment on my blog in April, and who says he or she would like to be entered in the drawing for the book, will be eligible. Coming soon–reflections on birthdays and messy beauty! Reblogged this on Dinner Snacks. Well I’m not beautiful or a warrior, but I certainly am messy. Maybe the book could help me with the other two?